Let your customers choose real-time UPS shipping quotes when checking out of your store. Have your UPS Access Code accessible. Click the Settings tab, then click Shipping. Click Add next to United Parcel Service (UPS). Input your Access Key to connect your UPS Account with your Online Store. Select your Domestic and International Shipping Options. (You can also select to limit the countries or regions you ship to). Choose your Pick Up Type and Rate To Display To The Customer. Note: Selecting List Rates gives your customers UPS published rates, and selecting Negotiated Rates can save you money if you've already set up negotiated rates with UPS. 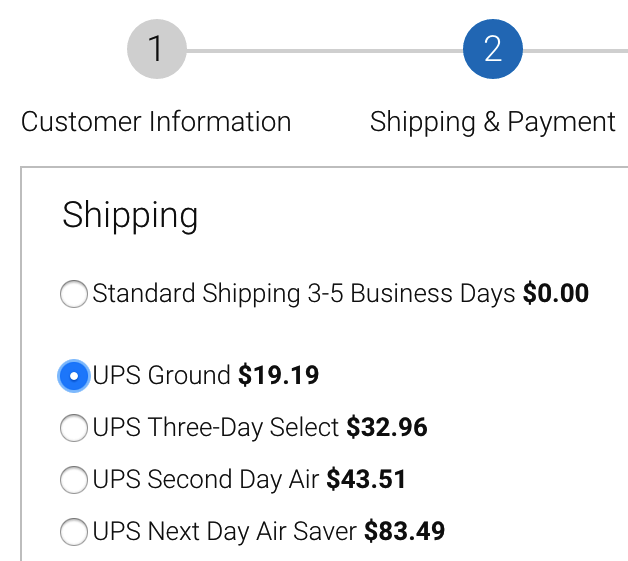 Your customers will be able to choose from a list of UPS shipping options and rates at checkout. Note: If you want shipping costs automatically calculated, you must set shipping for every product in the Shipping tab.